Embedded warping and blending for any visual application like simulators, signage and information displays as well as performance driven interactive solutions. The versatility and flexibility is unrivalled: VIOSO Anyblend hooks into the Windows desktop-applications and replaces their original appearance with a soft edge blended output across multiple projectors in native resolution. Using VIOSO’s patented camera technology edge blended projections can be realized in minutes with outstanding quality on any surface. This is achieved effortlessly by connecting projectors and any live camera to a PC and running the fully automatic setup. VIOSO Anyblend is designed for use in control and conference rooms, shows, gaming, interactive signage and any application that needs scalable and flexible high resolution displays. 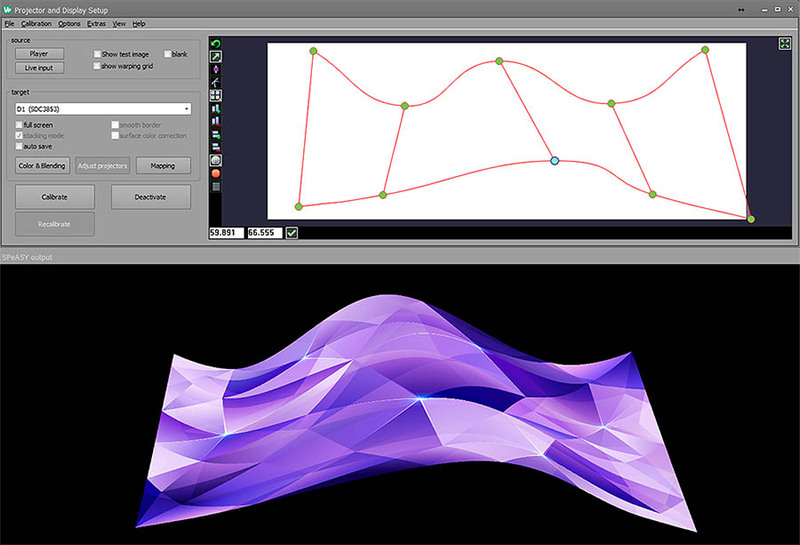 The calculated and captured display parameters are directly applied to the computer operating system eliminating the need for additional warping and blending hardware. VIOSO Anyblend works with any projector and is application agnostic. Manual or automatic warping & blending for any number of projectors. Our integrated tools are perfect for quick and high-quality results. Our patented auto alignment algorithms use an attached camera to automatically align the projection and to set up the warping and blending. Whether this is for a dome, a round screen or a projection mapping you will be excited by the versatile setup process. We recommend either Logitech-Webcams (C930) or – for more advanced setups – IDS-GigEYE-network cameras that provides a great flexibility. Embedding warping and blending to any application without latency. Manual or fully automated projector alignment for any number of projectors on any surface. Take images and pre-rendered videos, put them into a playlist and with the magic of VIOSO Core, you can display any content on any surface. 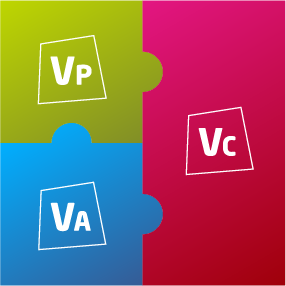 If you get VIOSO Anyblend, you will also automatically get VIOSO Core and VIOSO Player. Please have a closer look at the system requirements here. It is highly recommended to try the targeted hardware using the free demo version of VIOSO Anyblend before buying. You can test all of our software in a 30 day trial version. To buy our software you can simply contact us and we will inform you about pricing, payment and everything else you need to know. 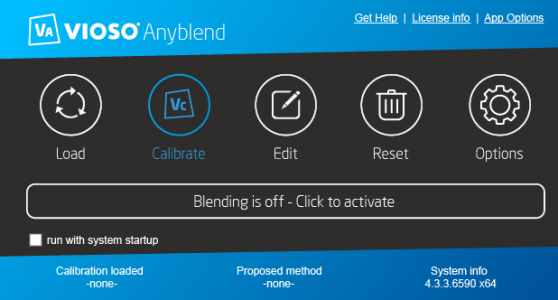 Are you looking for a more advanced Anyblend solution? Simulations require an extraordinary quality in terms of warping, linearity, blending, perspective setup and colour correction. The VR&SIM Edition is the ultimate answer to these requirements.